A significant proportion of my tuition sessions deal with Photoshop, Lightroom, and Photoshop Elements, helping the customer understand the various tools, layers, and filters do in Photoshop and Elements, and for Lightroom, setting up a good workflow from Import to Export. If you are struggling to get the best from your photography software, private tuition sessions will get you understanding the various tools, and build confidence that they can be used to good effect. It's usually a 4 hour session, or a couple of 2 hour sessions if done in the evening, but this can be varied depending on your requirements and experience, the session being tailored to ensure we cover what you want, and to help you get the best from your software. Lightroom especially can seem quite daunting, but with a methodical approach, and taking the time to set up default import and export settings, as well as watermarks, custom develop presets and more, this software can save a huge amount of time when processing your images. We'll cover all that, as well as the Library and Develop modules, to get you up and running, maximising what this powerful software can do for you. Affinity Photo is a relatively new software option, offering a fully-featured Photoshop alternative. I've been using it alongside Lightroom and Photoshop since 2017, and it's phenomenal value at under £50 for a one-off purchase. There are significant but sometimes subtle differences in the way the layers, filters, and controls work, so if you need help with this, get in touch. Software tuition normally takes place in the customer's home, as we really need to be working on your computer, with your images. If you have a laptop, and just want some help on certain aspects of the software, this can be incorporated into a normal private tuition session. I am available weekends* or weekdays, for any 4 hours during the day, though normally I book a 10am to 2pm session. As we are not dependant on the light for computer work, software tuition can be carried out in the evening at any time of year. If that's of interest, let me know and we'll see when we can schedule you in! * Weekend availability is limited, if you would like to book a tuition session on a Saturday or Sunday please don't be surprised if the majority of dates offered are 3 or more months away. Hot water for Daniel to drink. Whatever you want! It's private tuition, designed around what you want and need. Tell me what you want to learn, and I'll do my very best to get you up to speed. Lightroom tuition normally covers importing images, the Library module and how to use the catalogue and collections, the Develop module including all adjustment tools, develop presets, and import presets, and exporting of images including creating export presets and applying watermarks. As private tuition is tailored to your needs, your current knowledge isn't really a concern, we can get you up and running with confidence if you're a beginner, or help you with a specific area of your software if you're further along your processing journey. Software tuition is normally carried out at the customer's home. 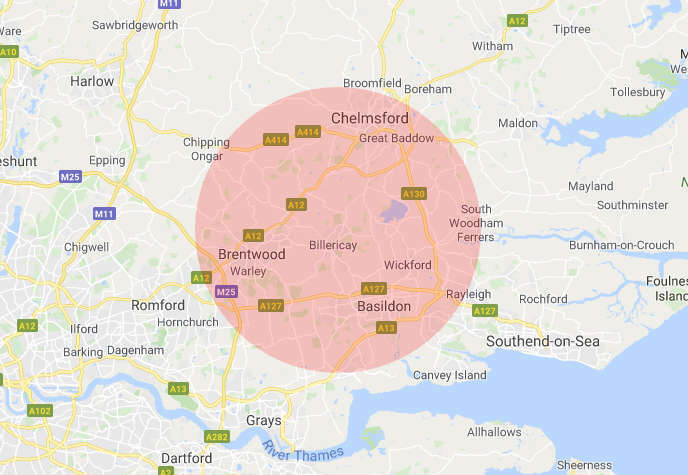 Please be aware that for private tuition I charge travel costs on sessions taking place more than approximately 10 miles from my home address, as a rough guide the map below shows the area in red where travel costs are included in the prices quoted above, outside of this area I am likely to make an extra charge, which will be advised at the time of booking. No. I have had customers as young as 11 benefiting from private tuition (I simply ask that children under the age of 16 be chaperoned), and would be happy for younger photographers to enjoy some tuition too. Younger photographers may be better with a couple of 2 hour sessions rather than a 4 hour one. Give me a ring, or email me, and we'll book you in! See the Contact page for details.